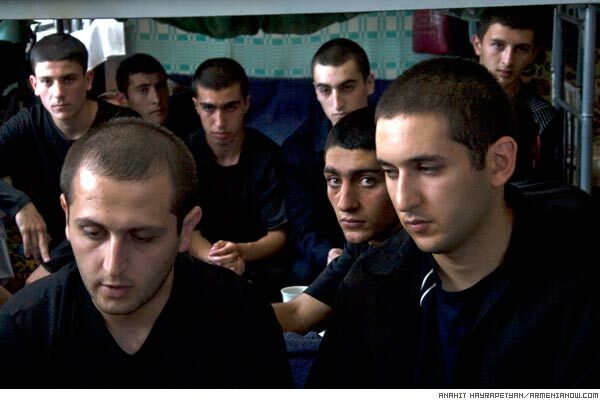 Sixty-six young men between 18 and 24 serve their sentence in the Erebuni penitentiary institution for refusal to obey military orders. The men are Jehovah’s Witnesses, whose religious convictions do not condone military service, have been sentenced for avoiding military service based on Article 327 of the Criminal Code of Armenia (12 more people are jailed to the Artik penitentiary). 364 Jehovah’s Witnesses have been sentenced to jail in independent Armenia for refusal to serve in the army. In 2001 as Armenia joined the Council of Europe it undertook obligation to release young people refusing from military service for religious reasons and pass a law on alternative service. However, the Jehovah’s Witnesses, who are the only group of believers refusing military service, were not released from prisons. After the law on alternative service entered into force in 2004, 22 Witnesses and a Molokan were sent to hospitals and orphanages as attendants, but refused the service after 5 months because of being supervised by the Ministry of Defense and the necessity to obey military and police orders. 15 were sentenced with charges in desertion and leaving the place of service for 2-3 years of imprisonment. They stayed in prison for about 7 months but owing to a consequent work (they had appealed also to the European Court of Human Rights) the local prosecutor generals’ offices mediation with the courts to send the cases to preliminary investigation; the prosecutor general’s office suspended the cases based on the lack of the corpus delicti. Now there is no one going for alternative service because of its military nature. On January 23rd 2007 the Council of Europe passed resolution 1532 calling on Armenian authorities to revise the law on alternative service in accord with the recommendations of the experts of the CE and to pardon the young conscientious objectors currently serving prison sentences. Ombudsman Armen Harutyunyan informs that taking into account numerous complaints from Jehovah’s witnesses about organizational shortcomings of alternative service, concerns expressed by certain international structures, as well as PACE resolutions 1361 (passed in 2004) and 1532 (passed in 2007), the field is being studied upon his assignment and a possibility of suggesting some changes in the law will be considered. Now no one wants to serve the alternative service because of its military nature. The condition of the believers who refuse military service did not improve after Armenia became a CE member; on the contrary it became even worse. There were about 20 prisoners of this kind 2 years ago, with their number having tripled within the past period of time. But it’s the terms of imprisonment rather than the number of believers that have grown. Before 2006 they were serving only one third of the term and were released before the scheduled time (for instance, one sentenced to 1 year of jail would be released after 3 or 5 months upon the court decision as a disciplined prisoner). However, in September 2006 the government introduced a new order of early release. No Witness was released after the decision. The oldest resident of the prison among the Witnesses Samvel Davtyan, 21 has served 2 years and 3 months (of the 2 years and 6 months). He recalls the last case of early release after serving one third of the sentence dates to early September 2006. According to a governmental decision the administrative commissions of the penitentiaries submit the candidacy of prisoner for early release to the newly formed independent commission and further to the court, if the independent commission gives a positive conclusion. But the administrative commissions ceased to name Witness prisoners as candidacies for early release. The prisoners say only 5 cases on their peer believers have reached the independent commission, but have been denied. The management of the prison grounds the fact of not submitting Witnesses’ candidacies with the lack of regret for their deeds on their side. “Jehovah’s Witnesses are known for their discipline, do not show criminal tendencies, have no negative set of mind, lead a healthy life. But in any case the basis for submitting a mediation of release is the regret,” says head of detachment Artak Davidyan, who has been working in the Erebuni institution for 2 years. None of the 66 prisoners plans to express regret: “We regret spending our time here. But we do not regret that we refused to take weapons, we don’t want to obey the military,” says Karen Smbatyan. 3 years ago Jehovah’s Witnesses were sentenced to only 1- 1.5 years, but today the terms have grown to 2 and more years. Vahe Musayelyan, 22, a graduate of the Engineering University, who has been in prison for a year and 8 months was sentenced to 1.5 years, but the Appeals Court changed the decision to 2 years and 6 months after a protest by the prosecutor. Mkrtich Smbatyan was sentenced to a year and 10 months, but the term was reviewed to 2 years and 6 months after the prosecutor’s appeal, with the Cassation Court leaving the verdict unchanged. Only one of them received a year of jail owing to his health problems. 5 have been given 3 years, a maximum term (the law stipulates up to 3 years). Ombusdman Harutyunyan cannot interpret application of more severe punishments to Jehovah’s witnesses, saying that according to the RA legislation Ombudsman is not authorized to intervene in judicial proceedings. The Jehovah’s Witnesses live in the three barracks of the 3-storied building. The first floor barrack is 25 square meters occupied by 18 prisoners, where the norms provide for 6-8 inhabitants (according to international standards each prisoner must have 4 square meters). Head of the institution Margaryan accepts the norms are not kept. The penitentiary is built to accommodate 370, but holds 565. The prisoners do not complain of other conditions. Samvel says the quality of food has improved during the 2 years of his stay, but they rarely use the meals of the diner, except for the bread. Still they say every one has tried the food, although they eat what their relatives bring. Their relations with the criminals are very good, they say, adding that they have effectively changed perceptions. “They had a wrong opinion about the Witnesses because of the distorted information. Many have changed their views now,” says Karen.